Hey-hey now! After work Saturday–which was hellish and something I refuse to get into–I got to spin around town and enjoy the rest of my day. From finding $5 books, to buying energy drinks that don’t energy, I eventually made a stop at Michaels Arts & Crafts. With pens drying up and erasers that has more erase than eraser, I did a quick inventory check in my head as to what I would need before I went in there and really lost my mind shopping. I knew I absolutely had to stay away from the sticker and scrap booking area. Since that’s where I usually go ham ‘n’ cheese in the wallet with ideas. I think it’s apparent these are off-brand markers (Artist‘s Loft? ), but I was good with that once I found them. 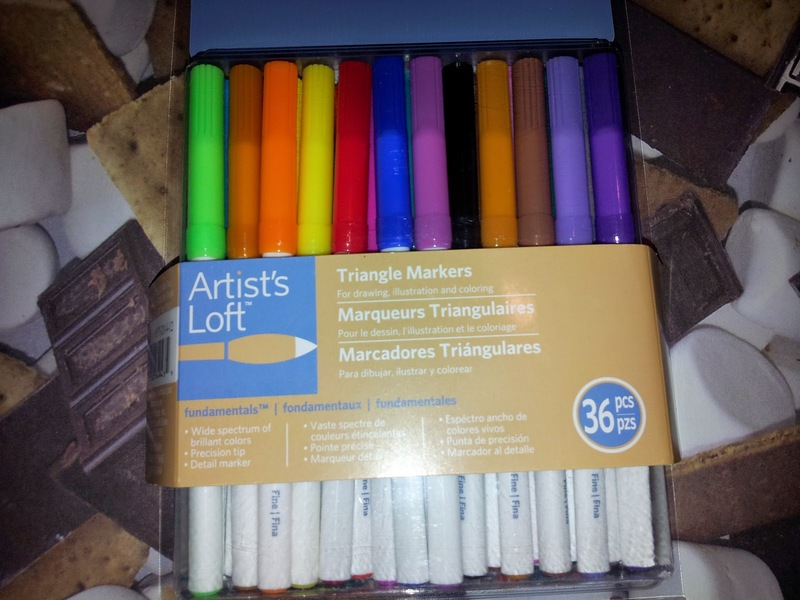 I really needed some fine tip markers and ran across this 36 piece pack for $4.99. I only use markers for those small, precision details; and I really needed a brown marker, seeing that my current one was all dried up and buying a replacement was $2! So after options browsing, I settled on this pack to get what I need to get done. More than anything, I needed a new ink pen. My lovely, lovely Precise V5 is on its last roll, causing the remaining ink to sputter out. I think everybody knows how much I love that pen for inking. I've been using that brand for years and can seem to find the pens at Wal-Mart. I don't think it’s a crafting pen, but what the hell. So I got this Faber-Castell Black India Ink pen with the same 0.8mm nib. It’s not rolling ball, but its nib isn't prone to smudging and absorbs fast. 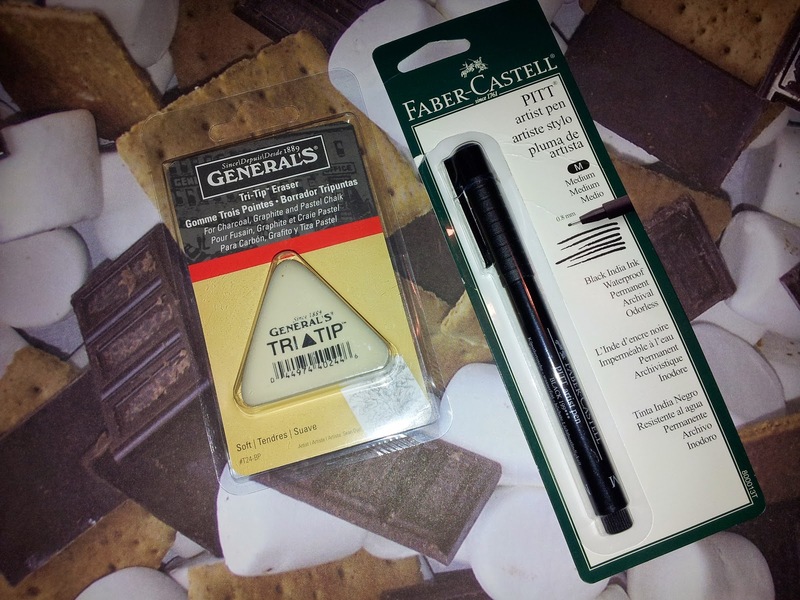 It wasn't until I got home that I realized I’ve bought one of these Faber-Castell 0.8mm pens before. And from my understanding, it dried out before I ever really used it. Unless I used it up during an art course. Anyway, the pen was $3.99 so that had better be the case. Lastly, I finally got a new eraser for everything but penciling. White eraser for pencil. Gummy eraser for pastels. Then I got home and realized I needed a new white eraser too. So is life. Anyway, this tri-tip eraser was $1.99. I love that it does have three tips because that'll help with precision, and keep me from chopping off smudged pieces from previous erasing endeavors. I think I budged well. All this for $11.96. Anyway, buying art supplies is an investment, right? I still need another pad of bristol board and a portfolio. Maybe next time. Hope you guys continue to have a great weekend! And keep drawing. No matter how good or how bad you think you are, always ART!